Shelby County ILGenWeb is a free genealogical site about the history of the county. We hope you find helpful clues for your research of ancestors and relatives of the county. Please consider contributing your pieces of Shelby county family history. YOUR HELP IS NEEDED. Our combined efforts can make this a great site for all who visit! You can use our Contact Form or email directly to me. Enjoy your stay, and come again soon! Co-Coordinator: YOU? Shelby ILGenWeb needs a local co-coordinator to provide more helpful responses to queries. Are you familiar with the area? Do you have a family tree connection to the county? Are you experienced at researching in Shelby County? If your answer to one of these questions is "Yes," please volunteer to be a Co-Coordinator. Shelby county was created January 23, 1827, securing the large northern part of Fayette County. It wasn't long (1829) before big areas were lost to Macon and Tazewell counties. Then, in 1839, Christian county claimed a bit. In 1843, a small portion was claimed by Moultrie county, finalizing Shelby counties boundries. 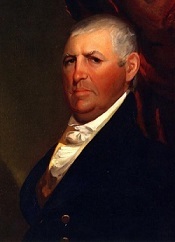 Shelby county was named in honor of Isaac Shelby, a soldier of the Revolution and Indian wars. He commanded the Kentucky troops in the battle of Thames in the War of 1812.